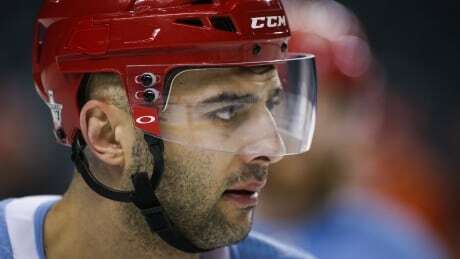 With the clock ticking on his career, Calgary Flames captain Mark Giordano is ready for a long run in the Stanley Cup playoffs. The 35-year-old is one of the favourites to win the Norris Trophy as the NHL's top defenceman after finishing the season with 17 goals and 57 assist for 74 points, but he has not achieved much success in the playoffs. "I don't take it for granted. I think I've seen how tough it is to get in. There's a bunch of years in a row where we didn't get in and the last four or five we flip-flopped," Giordano said after practice Wednesday. "You just don't want to have any regrets. You don't want to leave anything out there. You put it all on the table." Flames head coach Bill Peters doesn't want Giordano to put unnecessary pressure on himself as Calgary meets the visiting Colorado Avalanche on Thursday in the opener of a best-of-seven Western Conference quarter-final. "Can you elevate from what he's done? He's been outstanding. I don't want him to force the issue and thinking he's gotta do anything out or the ordinary. He's just gotta be Mark Giordano," Peters told reporters. Peters said every aspect of Giordano has been excellent offensively and defensively while playing heavy minutes. His average ice-time of 24 minutes 14 seconds was 16th in the NHL this season. But Peters feels the most important thing is the example Giordano sets for his teammates. "I think the guys respect him because of who he is and how he conducts himself both in the room and away from the rink and just his story," Peters said. "He believed in himself when he walked away and went to the KHL (in 2007-08) and comes back, let's say at an advanced age, he's a guy who's in the Norris Trophy hunt." Giordano said the team's last playoff series in 2017 — a four-game sweep by Anaheim — showed Calgary the importance of doing the little things right. He is excited about the possibilities this year. "You don't finish first in the west without having a good team obviously," Giordano said. "It would mean a lot. It's what we all play for. Being around and not being able to be part of it for a lot of years, you realize how quickly it can pass by and we have a good group in here, a really good team, and we gotta bring that confidence into Game 1." Flames netminder Mike Smith has fond memories of backstopping the Arizona Coyotes into the 2012 Western Conference final. He said at this time of year everyone is hoping to elevate their game. "It's definitely a new season," Smith said. "If you're a good player all season long, you want to up your game in the playoffs and be a better player when games matter the most."